Quick fry and excellent for your skin; Thai shrimp with ginger. 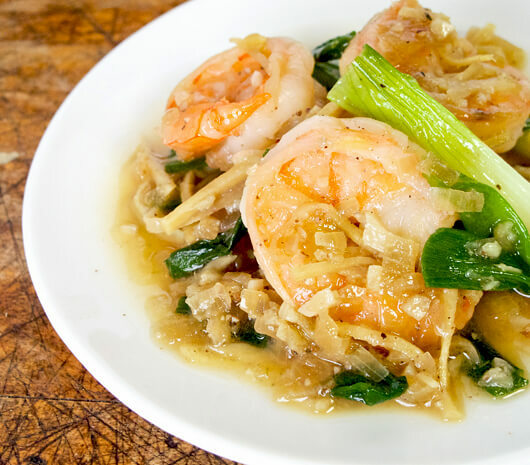 This ginger shrimp stir fry is the Thai version of shrimp scampi when it comes to the flavor profile! Healthier and more exotic (no butter or wine), this shrimp recipe is delicious when served with a bowl of plain white rice. The salty, peppery and gingery sauce has so much flavor, it doesn’t need to be complemented with anything else. A squeeze of lime will cut through the saltiness and add a refreshing component to this Northern Thai specialty. Shrimp are very easy to cook and a great substitute for meat. There are as many cooking options for shrimp as there are for chicken or beef; add them to a quick fried rice, any type of stir frys, inside dumplings, into a light soup broth (tom yum), with a salad.. The options are endless! A quick and flavorful way to cook shrimp. Shrimp are a great dieting food as they’re low in calories and fat. Containing lots omega-3 fatty acids, zinc and astaxanthin, they’re also good for your hair and skin (aiding in the reproduction of new cells). You know me when it comes to beauty foods; if it’s gonna make me look younger, I’m putting an asterisk next to it and add it to my list of ‘cook more often’! For years shrimp go a bad reputation for being high in cholesterol, but many recent researches are proving otherwise. They’re nowhere near as bad as saturated fats because they don’t raise the blood cholesterol as significantly, making this ginger shrimp stir fry safe to eat and very satisfying! 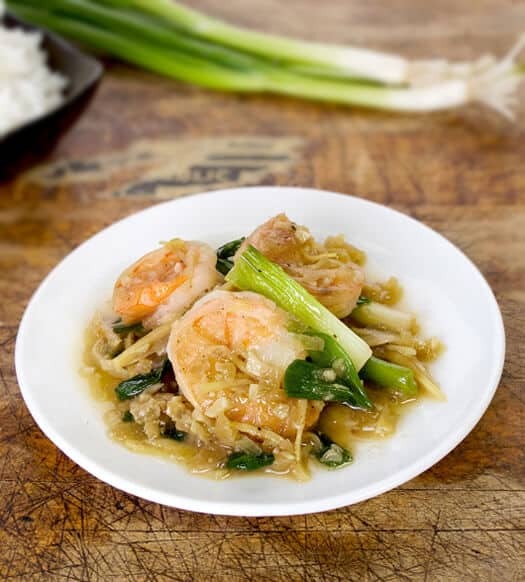 Cooked with ginger in a soy and fish sauce broth, this dish will take you back to Thailand. In a large pan (or wok) over high heat, add vegetable oil, garlic, ginger and onions, and cook for 3 minutes, until onions have soften. Add shrimps, cook for 30 seconds and add water, fish sauce, soy sauce and sugar, and cook for 2 minutes, tossing the shrimps around. Add ground white pepper and scallions, toss and cook for a minute, and serve with lime wedges and a bowl of rice. I use: Red Boat Fish Sauce because it’s 100% pure and chemical free. This is a delicious recipe for shrimp. We cook lots of shrimp in my house. I am always on the lookout for a new way to have it.